Since mobile cellular became commercially available in the early 1980s, it has advanced beyond imagination in terms of coverage, services, technology, handsets and regulation. 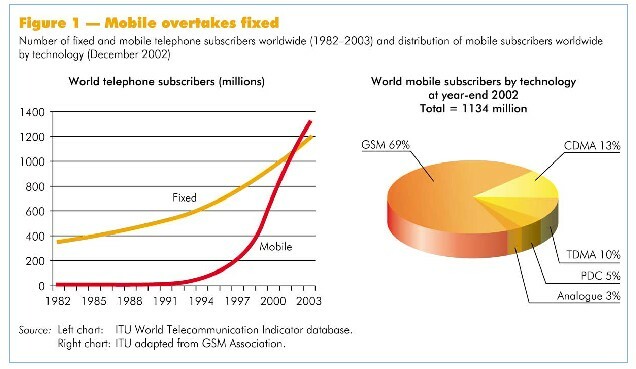 Perhaps the most revolutionary change is that in the space of around 20 years, mobile subscribers surpassed fixed-telephone line subscribers in 2002, making mobile technology the predominant means of voice communications (see Figure 1, left chart). 1 The Personal Handyphone System (PHS) is a digital system launched in Japan in 1995. As a low-cost alternative to cellular, it has limited coverage area. There were 5.6 million PHS subscribers, all in Japan, at December 2002. Global System for Mobile Communications (GSM). This is the predominant technology worldwide and the predominant system in Europe. It is also used in many nations in Africa, Asia, the Middle East and some countries in the Americas. At December 2002, there were 788 million GSM subscribers on 467 networks in 169 countries. Time Division Multiple Access (TDMA). This is the leading technology in the Americas with 109 million subscribers at December 2002. Code Division Multiple Access (CDMA). At December 2002, there were 147 million CDMA subscribers with 61 per cent in the Americas, 37 per cent in the Asia-Pacific region and less than two per cent in Europe, the Middle East and Africa. Personal Digital Cellular (PDC). This system is deployed only in Japan with 60 million subscribers at December 2002. A significant development with 2G systems has been the increasing utilization of data-like services, for example, the short message service (SMS), which allows text messages to be sent between mobile handsets. Some 360 billion SMS were sent over GSM networks in 2002.2 Mobile handsets are also increasingly being used to access the Internet. This has become successful in countries such as Japan, where 80 per cent of cellular users subscribe to a mobile Internet service provider.3 The growing use of mobile data has led to demand for faster speed than the initial transmission rate of 9.6 kbit/s for GSM. This is being accomplished by upgrading existing GSM networks with the deployment of General Packet Radio Service (GPRS) technology. In the case of cdmaOne networks, they are being enhanced with CDMA2000 1X technology. These technologies offer speeds that are equivalent to, or even faster than, conventional dial-up. 3 See the “Internet Provider Services (Mobile Telephone)” section of the “Number of Subscribers” report issued monthly by the Telecommunication Carriers Association (TCA) of Japan. In December 2002, TCA reported that there were 59.5 million subscribers to the mobile Internet services known as i-mode (provided by the NTT DoCoMo Group), Ezweb (provided by the au Group and the Tu-Ka Group) and J-sky (provided by J-Phone). This is out of a total of 73.5 mobile telephone subscribers (see www.tca.or.jp/eng/database/daisu/yymm/0212matu.html). The need for faster speed, global compatibility and multimedia services has led to the development of 3G systems. In an effort to consolidate existing incompatible mobile environments into a seamless global network, ITU adopted a family of radio access methods at its Radiocommunication Assembly in Istanbul in early May 2000. Known as International Mobile Telecommunications-2000 (IMT-2000), this global standard was realized after years of collaborative work between ITU and the global cellular community. At the end of May 2000, the World Radiocommunication Conference (also held in Istanbul) identified additional frequency bands for 3G (IMT-2000) use.4 IMT-2000 consists of five different radio access methods: W-CDMA (Wideband Code Division Multiple Access), CDMA20001X, TD-SCDMA, EDGE (Enhanced Data Rates for GSM Evolution) and DECT (Digitally Enhanced Cordless Telecommunications). The evolutionary path from 2G to 3G has been mapped out for existing networks (see Figure 2). Migration differs depending on the existing 2G network. In general, W-CDMA would require a brand new network to be installed whereas CDMA2000 1X requires less investment as an upgrade from existing second-generation CDMA networks. 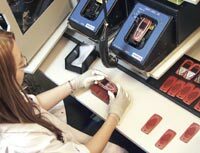 Among the five radio access technologies approved as IMT-2000, W-CDMA and CDMA2000 1X have gained the most support from regulators, mobile network operators and equipment manufacturers. At the end of 2002, there were 119 licences that had been awarded to operators around the world for the use of IMT-2000 spectrum to offer 3G mobile services. An important consideration in the 3G licensing process is exactly what is being offered. In most countries, the licensing includes the needed spectrum, typically in the 2 GHz range. In some cases, particularly most of Europe, the 3G radio interface was also specified. In other cases, there was no explicit requirement for a specific radio interface as long as it was one identified in the IMT-2000 standard. While auctions and beauty contests have been the preferred licence allocation methods, some countries have automatically granted 3G licences to incumbents. For example in Europe, 3G licences were offered free of charge to the incumbent mobile operators in the Isle of Man, Liechtenstein and Monaco. The optimum method of allocating licences is subject to debate. Proponents of auctions will argue that frequency is a scarce resource and its pricing should be left to the market. Backers of beauty contests will argue that their method avoids high auction prices that will eventually be passed on to consumers. There are also political aspects since, in some instances, the licence fees revert to the government budget. In this method of licence allocation, a frequency range identified for the use of 3G networks is auctioned. A number of licences are made available depending on spectrum and market conditions. Successful applicants are those that outbid others. There has been great variation in the relative price paid for 3G licences that have been auctioned. The average price per capita in Germany and the United Kingdom amounted to EUR 615 and 644 respectively. In contrast, Austria and Denmark collected an average licence price per capita of EUR 103 and 95. One reason is timing. Germany and the United Kingdom were among the first to auction 3G licences. Euphoria was high, as were the prices. It is possible that licences will be sold at or near their reserve price (i.e., minimum bid price) when the number of bidders is the same or less than the number of licences available. Such was the outcome when Switzerland conducted its auction in December 2000. Auctions can also be cancelled under such circumstances, as was the case in Singapore and Slovenia where the bidders simply paid the reserve price. In total, 77 licences for 3G have been granted in 19 economies via auctions, accounting for USD 101 billion (see Table 1). In a beauty contest, a fixed number of licences are awarded to applicants that best meet certain criteria. The regulator issues an invitation to all interested parties with guidelines and requirements. Successful applicants are chosen based on specific pre-determined criteria presented in the application. The selection criteria differ from country to country, depending on the respective plans and objectives in establishing a 3G network. In general, applicants are evaluated based on their financial capacity, business plan and technical expertise. Criteria that are often used are commitments to rapid roll-out and with high levels of land and population coverage. Other aspects such as market concentration and technological specifications are also taken into consideration. Like a real beauty pageant, applicants are awarded points for satisfying the specific criteria stipulated. Applicants with the highest scores are awarded licences. Normally, licensees also pay a fixed licence fee, but some countries, like Japan and Finland, waived this fee. In this method, licence costs are significantly lower than the auctioned licences, yet France and Poland were noteworthy for having high fees. Some 41 3G licences have been issued in 13 countries via beauty contests accounting for USD 6.9 billion (see Table 2). Universal Mobile Telecommunications System (UMTS) is the term Europe uses to refer to 3G networks. It maps out the migration path for GSM networks to 3G. UMTS uses the IMT-2000 W-CDMA radio interface in the frequency bands 1900—1980 MHz, 2010—2025 MHz and 2110—2170 MHz. In December 1998, the European Parliament mandated that all European Union (EU) member countries adopt UMTS. The decision imposed a specific timetable for UMTS, including a deadline for licensing by 1 January 2000 and introduction of commercial services by 1 January 2002. All EU members had completed the 3G licensing process by May 2002. Non-EU countries in Western Europe such as Norway and Switzerland have also completed the 3G licensing process. In Central and Eastern Europe, the Czech Republic, Latvia, Poland, the Slovak Republic and Slovenia have licensed 3G operators. By 31 December 2002, some 26 countries and territories in Europe had completed 3G licensing processes. In the Asia region, economies such as Hong Kong, China; Israel, Japan, the Republic of Korea, Malaysia, Singapore and Taiwan, China had issued 23 licences for 3G by December 2002. In the Oceania region, Australia and New Zealand have allocated spectrum and awarded licences for 3G. Canada is the only country from the Americas region that has auctioned 3G spectrum in the 2 GHz range. Several countries in the Americas have already allocated licences for so-called Personal Communications Services (PCS) that take up parts of the spectrum bands identified for 3G services. There are several factors holding back the allocation of additional spectrum for 3G in the region. One is that local operators have already invested heavily in building their 2G networks (in the 1900 MHz band). Additional spectrum would require more investments which operators are presently unable or unwilling to make. Another factor is the plurality of different systems in the region (i.e., TDMA, GSM and CDMA), which complicates the migration path from 2G to 3G. 1 Where there was a formal 3G licence process. 2 Launched as an extension of existing networks. In some countries, spectrum in the IMT-2000 bands cannot be made available as it is used for national security purposes. Finally, existing spectrum bands (1850–1990 MHz) can be used to provide 3G-type services and operators in the region with CDMA networks are choosing to evolve to CDMA2000 1X (recognized as an IMT-2000 standard) without the need for additional spectrum. 5 See Ericsson’s Press release of 2 April 2003: “Ericsson and Nigeria’s RelTel Sign CDMA2000 1X” (www.ericsson.com/press/20030402-083853.html). Roll-out of 3G networks is in theory guided by timetables stated in the licence conditions such as required minimum coverage by a specified date. However, market demand and handset availability have impacted deployment schedules and many networks have been delayed. In Asia, SK Telecom of the Republic of Korea launched its CDMA 2000 1X network in October 2000.6 Japan’s NTT DoCoMo pioneered the deployment of W-CDMA, launching its 3G service commercially in October 2001. 6 See “SK Telecom Launches Commercial cdma 2000 1x Service”, Press release of 30 September 2000 (www.sktelecom.co.kr/english/newspr/news/2002/06/01/219,1012,0,0,0.html). SK Telecom was awarded a 3G licence but for a network using W-CDMA technology. Republic of Korea mobile operators consider CDMA2000 1X to be a 2.5G network. For example, LG Telecom, a Republic of Korea mobile operator states on its website that “CDMA2000 1X is a 2.5 generation Mobile Communication Service” (see (www.lg019.co.kr/docs/eng/imt/imtcdma01.jsp). In Europe, commercial 3G services based on W-CDMA were not available by 1 January 2002, as had been called for in the EU guidelines. Nascent 3G networks established in Austria, Finland, the Isle of Man and Monaco initially provided trial services. Manx Telecom, on the Isle of Man launched Europe’s first 3G network in December 2001, and services became commercially available in July 2002. Although Finland was the first country in the world to license 3G, and incumbent operator Sonera met licensing conditions by having its network available on 1 January 2002, commercial service was not available until September due to lack of handsets. 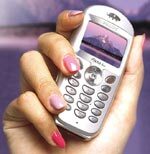 Austria’s Mobilkom launched its 3G network on 25 September 2002. In March 2003, Hutchison commercially launched 3G services in the United Kingdom and Italy, as well as in Australia in April and in Sweden in May. Overall, uptake of 3G services based on W-CDMA has been slower than initially announced. Handset availability and network interoperability have been cited as reasons for the sluggish 3G market. Low market interest has further exacerbated this scenario. The only other W-CDMA launches have been in Japan, where in addition to NTT DoCoMo, J-Phone launched a W-CDMA network in December 2002. These two operators had a combined 153 200 3G subscribers at year-end 2002. 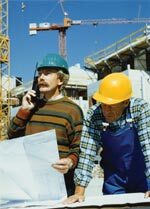 The use of CDMA2000 1X in existing mobile frequencies as an IMT-2000 standard has led to more rapid launches. Except for Japan, all CDMA2000 1X networks have been launched without the need for a new licence as they operate in existing licensed radio frequencies. By the end of December 2002, there had been 30 commercial CDMA2000 1X launches in 17 countries.7 The number of CDMA2000 1X subscribers at December 2002 was 32.6 million with the vast majority in the Republic of Korea and Japan. 7 See the “Operators” section of the 3G Today website for updated listings of commercial CDMA2000 1X launches (www.3gtoday.com/operatorsflash.html). There have been considerable delays in the introduction of 3G and market penetration of licensed systems was less than 0.4 per cent of total worldwide mobile subscribers, some four years after the licence process began. Few EU countries met the directive of launching commercial 3G services by 1 January 2002. In retrospect, 3G licensing can be questioned on two grounds. One was the EU process that compelled members to abide by a specific timetable. It is debatable whether this was practical for a brand new service where infrastructure availability and reliability was unknown and market demand was at best, sketchy. This is particularly relevant in the GSM world, where at the time of licensing, few operators had experience with high-speed data networks. The second issue relates to the fact that CDMA networks can be upgraded to CDMA2000 1X without operators having to apply for a 3G licence. This has given CDMA network operators an advantage over GSM operators. 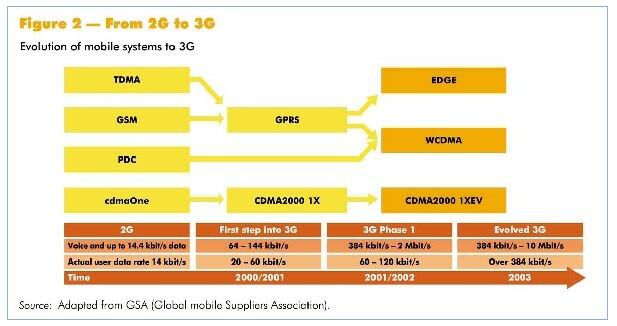 On the other hand, there is confusion about whether CDMA2000 1X is truly 3G, especially since operators that have launched those networks refer to them as 2.5G. A CDMA2000 1X network offers data speeds of 144 kbit/s versus 384 kbit/s for W-CDMA. The majority of countries in the world have yet to license or deploy 3G networks. The contrast is even starker between developed and developing nations. Countries that have not yet licensed IMT-2000 networks have several options, based on the benefit of hindsight. One is that there may be no hurry to license 3G. The first W-CDMA 3G networks have only recently been deployed at great cost — and all in developed nations. At this point in time, it may prove difficult for many developing countries to find investors willing to invest in a brand new 3G network. Instead, countries might consider upgrades to existing networks, evolving them to 2.5G as a first step to 3G. For GSM networks, this means the deployment of GPRS while for cdmaOne networks it involves the installation of CDMA2000 1X. This would provide faster speeds and greater functionality for the development of mobile data services. If these upgrades do not require changes to existing frequency allocations, then it may be wise to encourage such enhancements without requiring a new licence. If additional spectrum is required within the same frequency, regulators should be encouraged to act favourably upon this request in the light of the benefits such spectrum could bring. If new 2G mobile licences are to be issued, then the authorities may wish to encourage operators to install their networks as 2.5G-ready.